The latest weekly United States Mint numismatic product sales report includes the debut figures for two newly released products, the 2013 Proof American Silver Eagle and the 2013 America the Beautiful Quarters Proof Set. The 2013 Proof Silver Eagle went on sale January 24, 2013 and typically represents one of the Mint’s most popular annual offerings. The coins were offered with no stated maximum mintage and no household ordering limit. Through the reporting date of January 28, sales have reached 258,860 units. This comes in lower compared to the debut figures from the prior two years. The individual 2011 and 2012 Proof Silver Eagles had opened with sales of 367,623 and 299,539, respectively. The 2013 America the Beautiful Quarters Proof Set also makes a slower start compared to the previous year. This year’s opening sales of 48,901 units compares to 50,774 for the prior year set. Sells outs for 2012-dated numismatic products continue to take place. During the current reporting period, the 2012 Uncirculated Mint Set has sold out with a cumulative sales total of 392,000. In similar fashion to the 2012 Proof and Silver Proof Sets, this marks a faster sell out and significantly lower final sales than the prior year. The 2011 Uncirculated Mint Set had reached sales of 533,529 after remaining available for nearly two years. Interesting that Cleveland 2nd term had sales of negative 29 proof coins. I ordered (on first day of sales) my usual one proof & two uncs and for the first time in my history with the first spouse series I had to return BOTH of the uncs. for being unsatisfactory examples. Not an expert in metallurgy – but I think the problem was what the mint advised about – poor metal flow. All the other 2012 FS coins received were just fine & dandy. I continue to be surprised at the relatively poor performance of the proof silver eagle. I thought for sure that a combination of the 2012 sellouts and the silver shortage would drive buyers to this offering. Looks like I was wrong. Seems like we are in for another year of lower lows in terms of sales figures. That’s funny, I just received my 2012 First Spouse coins and the only one that had a problem was the same one you had problems with: Frances Cleveland 2nd Term Uncirculated. And, it was the metal flow problem on my coin too. As soon as I saw it, the Mint’s statement about that came back to me. Please let me know if you get better ones when you get your replacements. I’m wondering if such a thing as a perfect Cleveland 2nd Term Unc exists. Of course, I don’t have much time to decide if I want to return mine or not. I’m a little afraid to, since the problem isn’t too glaring and I might get a worse coin or packaging with the replacement. You probably should’ve kept them. They were probably error coins. Just returned the coins & cancelled – no replacements. If just one of the uncs was bad I would have asked for a replacement – but two out of two – no way. Sales of the uncs on the latest report are 1520 units so perhaps there are some good ones coming from the mint. As I said these are the only FS coins I have had to return (so far) and I really would have liked adding them to the collection – but not interested in such imperfect merchandise. The only error was the one the mint made with a lack of quality control & sending damaged coins to a good customer. Could you expand on the problems you had with the Unc. Cleveland coins. I looked at mine and they seemed OK. Didn’t check them to closely but maybe I should since you have had some trouble. Not an expert & don’t really know the proper terminology to use to explain the problems with the coins. I use a magnifier & bright light to examine the coins & tilt them in various directions. On the obverse of one coin there was what I would describe as a halo effect to the right of Frances face. In addition to that there was a small black mark (grease?) just above the “PH” initials. This was on the coin – not the capsule. On the reverse of the second coin there was a small oval shaped area beneath outstretched arm & maybe that was the “poor metal flow” that the mint said was the problem causing the long delay for the 2012 FS coins. If you know a friendly coin dealer in your area perhaps you should show the questionable item & ask for an expert opinion. 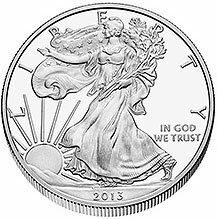 Lower sales for the 2013 Proof Silver Eagle? Gee – I wonder if it has anything to do with the price of the coin?? It seems hard to justify paying more than double the price of silver when the Mint will produce 700,000 coins or more. Another problem is that if you need to sell the coin quickly, you might take it to a coin shop which will only pay you the current price of silver. Seems like the better investment is the bullion coin at a slight premium to the current silver price. I love the Proof Silver Eagle – but the Mint is pricing me out of the game in this tough economy. Just my 2 cents worth. I also have 2 sets running of the first spouse uncirculated coins and had returned quite a few of the 2011 coins with many of the issues you described other than the grease mark. In fact after checking my paperwork, I went through 5 lucretia Garfield to keep 2. I changed my ordering process and ordered the 2012 coins on the first day of sale for each, and out of 8 only returned 1. I only look for eye clean and its a shame that their quality control is not a little better at least on the higher end coins where the mintage is not huge. Good to hear there are a few of us who are collecting the FS coins. What I can’t understand is the pricing on some of the coins. For instance, APMEX is selling OGP FS Julia Tyler proofs (mintage of 4830) for around $1900 per but are selling Lucy Hayes proofs (mintage of 3885) for about $700 less. I can understand the pricing for the FS coins where there was no spouse because a number of collectors are collecting the subset but the reasoning on the low mintage coins evades me. Is it that people only want to collect the good looking spouses vs. the average ones? Your thoughts?